Alzheimer's disease (AD), a neurodegenerative disease, is the most common cause of dementia and characterised clinically by progressive intellectual deterioration together with declining activities of daily living and neuropsychiatric symptoms or behavioral changes. The most striking early symptom is memory loss (amnesia), usually manifest as minor forgetfulness that becomes steadily denser with illness progression, with relative preservation of older memories. As the disorder progresses, cognitive (intellectual) impairment extends to the domains of language (aphasia), coordinated movement (apraxia), recognition (agnosia) and those functions (such as decision-making and planning) closely related to the frontal lobe of the brain, reflecting extension of the underlying pathological process. Arthritis (from Greek arthro-, joint + -itis, inflammation) is a group of conditions that affect the health of the bone joints in the body. One in three adult Americans suffer from some form of arthritis and the disease affects about twice as many women as men. 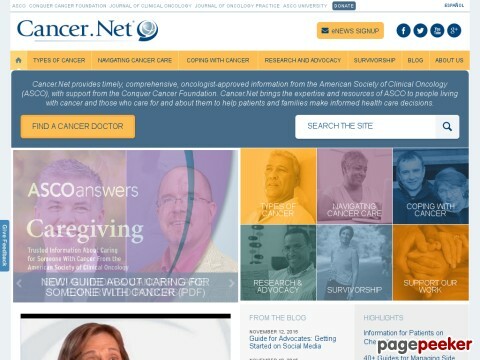 People Living With Cancer (www.plwc.org) - accurate, reliable and oncologist approved cancer information from the world's leading organization representing medical professionals who treat people with cancer.